Accepta 2815 is a high performance liquid formulation containing an alkali and effective sludge conditioner. This highly effective coagulation programme is primarily formulated for conditioning boiler feed water with medium to high hardness (in excess of 60 ppm total hardness). Applications for Accepta 2815 are mostly for low pressure steam plants or industrial hot water systems that are not atmospherically balanced or pressurised with air. Accepta 2815 may be used as a single treatment or in combination with other suitable products where necessary. When use situations necessitate Accepta 2815 is in compliance with US FDA regulations relating to Boiler Water Additives (21 CFR 173.310). Excellent single product coagulation programme for conditioning boiler feed water with medium to high hardness. Ideal for low pressure steam plants or industrial hot water systems that are not atmospherically balanced or pressurised with air. Complies with US FDA regulations, Boiler Water Additives (21 CFR 173.310). Product dosage is based on the feed water total harness and total alkalinity. In a coagulation programme, alkalinity is usually used to control treatment dosage. The “P” alkalinity is normally set between the extreme limits of 150 ppm to 500 ppm. 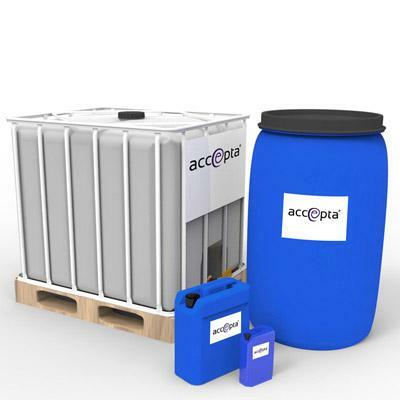 Accepta 2815 should be fed continuously to the feed water for maximum scale and corrosion control. Under certain circumstances, it may be “slug” fed for alkalinity elevation using a suitable feeder. Accepta 2815 is preferably fed neat directly using a chemical feed pump. Product control is based on alkalinity measurement of boiler water.The “P” alkalinity in the boiler water should be maintained between 150 and 500 ppm.